The 2016/17 Bundesliga season is fast becoming one of the most unpredictable in living memory. 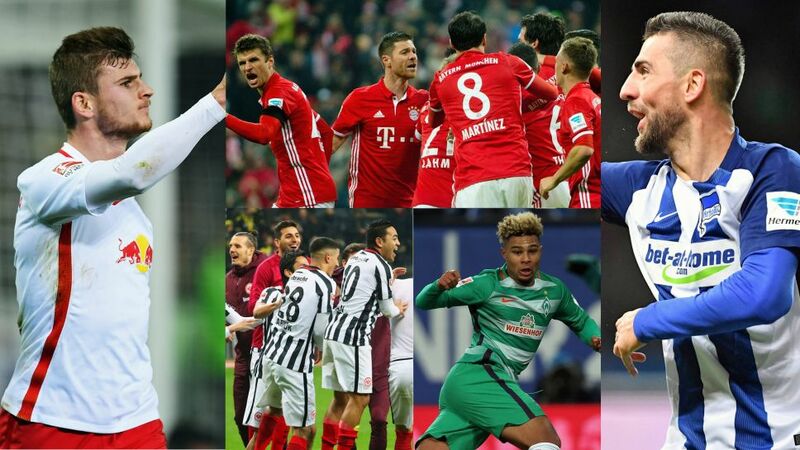 The 2016/17 Bundesliga campaign continues to surprise and delight in equal measure, and the past weekend of high-octane action was no exception. How did your Official Fantasy Bundesliga team fare on Matchday 12? Find out here! Despite ending a two-match winless run with a workmanlike 2-1 victory over Bayer 04 Leverkusen, defending champions FC Bayern München look to have a real fight on their hands to keep hold of the Meisterschale for a fifth successive season. Carlo Ancelotti's side occupy second place at present, with new boys RB Leipzig maintaining their three-point cushion on their illustrious top-flight peers and 12-game unbeaten start thanks to a demonstrative 4-1 win at SC Freiburg. The current top two meet at the Allianz Arena on Matchday 16. Borussia Dortmund beat Bayern in Der Klassiker last weekend, but the inconsistencies that have plagued their season came back to haunt them on Matchday 12. Head coach Thomas Tuchel cut a frustrated figure at Eintracht Frankfurt's Commerzbank-Arena as BVB succumbed to their third Bundesliga defeat of the season - a result that leaves them some nine points adrift of Leipzig. Moving up to third in their stead, well-oiled Frankfurt - who also held Bayern at home on Matchday 7 - are now unbeaten in their last six and dreaming of European football. Eintracht's notable start to the campaign stands in stark contrast to their relegation near-miss of 2015/16. The Eagles survived via the play-offs after losing to SV Werder Bremen on the final day last term, but are already 16 points clear of an extremely crowded drop zone. Just six points separate rock-bottom Hamburger SV and 15th-in-the-table VfL Wolfsburg and, with second-bottom FC Ingolstadt 04 showing signs of life under new head coach Maik Walpurgis, even 13th-placed Borussia Mönchengladbach are in danger of being sucked into the drop zone. If there was one positive to be gleaned from Gladbach's 1-1 draw with unbeaten TSG 1899 Hoffenheim, it was the performance of 20-year-old Mahmoud Dahoud. The Syria-born midfielder opened the scoring in Sinshiem and is one of a bumper crop of native starlets to have taken the Bundesliga by storm. Joshua Kimmich (21) and Julian Brandt (20) were the standout performers for Bayern and Leverkusen respectively in Saturday's blockbuster fixture in Munich, Serge Gnabry (21) secured a point for Bremen in the Nordderby in Hamburg and Timo Werner (20) inspired Leipzig to their seventh win on the trot with a brace against Freiburg. The Bundesliga's pioneering production line simply cannot be faulted. As if to illustrate the point, 1. FSV Mainz 05 striker Aaron Seydel scored with the first shot on goal of his Bundesliga career on Sunday. The 20-year-old's debut strike proved nothing more than a false dawn for the 05ers, however, as veteran front man Vedad Ibisevic raised the bar with his 99th and 100th Bundesliga goals to propel Hertha Berlin to a deserved 2-1 win. The evergreen Bosnia-Herzegovina international now sits sixth in the Bundesliga's all-time leading foreign scoring charts, behind legendary quintet Claudio Pizarro, Giovane Elber, Robert Lewandowski, Stephane Chapuisat and Ailton. Much like any vintage red worth its salt, the 32-year-old just gets better with age.